Chuh, A., Zawar, V., Karad, G. (2016). A Case-Control Study on the Take-Off Sign in Lesional Skin Biopsies of Patients with Pityriasis Rosea. Iranian Journal of Pathology, 11(4), 416-417. Antonio An Tung Chuh; Vijay Zawar; Gayatri Karad. "A Case-Control Study on the Take-Off Sign in Lesional Skin Biopsies of Patients with Pityriasis Rosea". 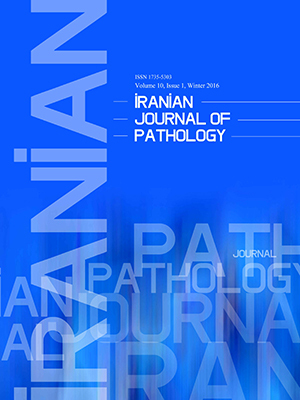 Iranian Journal of Pathology, 11, 4, 2016, 416-417. Chuh, A., Zawar, V., Karad, G. (2016). 'A Case-Control Study on the Take-Off Sign in Lesional Skin Biopsies of Patients with Pityriasis Rosea', Iranian Journal of Pathology, 11(4), pp. 416-417. Chuh, A., Zawar, V., Karad, G. A Case-Control Study on the Take-Off Sign in Lesional Skin Biopsies of Patients with Pityriasis Rosea. Iranian Journal of Pathology, 2016; 11(4): 416-417. Lesional histopathological features in pityriasis rosea (PR) are non-specific (1). Our aim here is to investigate whether a histopathological take-off sign (TOS) is associated with PR. We searched our records, and retrieved the 30 most recent patients with PR diagnosed according to a diagnostic criteria (2). Eight records had histopathological images available. For each, we retrieved the next patient record with differential diagnoses of PR (guttate psoriasis, nummular dermatitis, pityriasis versicolor, tinea corporis, drug eruptions) and with histopathological images available. Six (75%) patients (three with typical PR, one with facial lesions, one with actinic PR, one with PR inversus) and no control subject had TOS (Fig. 1). As we proceed from the uninvolved to the lesional skin (opposite to the direction of the disease progression), the superficial layers of stratum corneum gradually elevate while separating from the more basal layers. The floating part then deviates further away from the specimen, akin to an aircraft taking off. All controls (one with nummular dermatitis with id eruptions, two with psoriasis vulgaris, one with pityriasis versicolor, two with tinea corporis, one with secondary syphilis, and one with PR-like drug rash) did not exhibit TOS (two-tailed P: less than 0.01). Lesional histopathological changes in PR are non-specific, with inter- and intra-oedema, focal caps of spongiosis (6-9), Unna’s sign (eczematoid pattern), Lowenbach’s sign (thinning of the granular layer), Sabouraud’s sign (exudating erythrocytes in the papillary dermis, homogenisation of papillary collagen (7), and intraepidermal dyskeratotic keratinocytes (4-5) having been reported. However, the sensitivities are low. The mechanism of TOS is due to peripheral collarette scaling. The morphology of collarette scaling is that fine fragments of scales are attached only at the periphery of the lesion, symbolising a tendency of peeling from the centre towards the edge. Mysore (2010) reported lifting off parakeratotic scale for PR (10). We believe that the mechanism is related to peripheral collarette scaling and the resultant hanging curtain. Depression of surface epidermis unrelated to openings of eccrine sweat ducts or pilosebaceous ducts has been reported in lichen sclerosis et atrophicus and PR. We found this sign in two patients, and minimal depression in another two. Further explorations are recommended. A limitation in our study is the small number of patients. Owing to the nature of the study, we were unable to provide full demographic, clinical, and histological data of the patients. We thus conclude that PR is significantly associated with TOS. Chuh AAT, Zawar V. Pityriasis rosea. In: Harper’s Textbook of Pediatric Dermatology (third edition). Edited by Irvine AD, Hoeger PH, and Yan AC. Wiley-Blackwell, Oxford. 2011 (ISBN: 978-1-4051-7695-8). Chapter. 84: 84.1-84.5. Chuh AAT. Diagnostic criteria for pityriasis rosea – a prospective case control study for assessment of validity. J Eur Acad Dermatol Venereol. 2003;17(1):101-3. Chuh A, Zawar V, Law M, Sciallis G. Gianotti-Crosti syndrome, pityriasis rosea, asymmetrical periflexural exanthem, unilateral mediothoracic exanthem, eruptive pseudoangiomatosis, and papular-purpuric gloves and socks syndrome: a brief review and arguments for diagnostic criteria. Infect Dis Rep 2012;4(1):e12. Kempf W, Burg G. Pityriasis rosea – a virus-induced skin disease? An update. Arch Virol 2000;145(8):1509-20. Özyürek GD, Alan S, Cenesizoğlu E. Evaluation of clinico-epidemiological and histopathological features of pityriasis rosea. Postepy Dermatol Alergol 2014;31(4):216-21.
el-Shiemy S, Nassar A, Mokhtar M, Mabrouk D. Light and electron microscopic studies of pityriasis rosea. Int J Dermatol 1987;26(4):237-9. Panizzon R, Bloch PH. Histopathology of pityriasis rosea Gibert. Qualitative and quantitative light-microscopic study of 62 biopsies of 40 patients. Dermatologica 1982;165(6):551-8. Bunch LW. Tilley JC. Pityriasis rosea. A histologic and serologic study. Arch Dermatol 1961;84(1):79-86. Takaki Y, Miyazaki H. Cytolytic degeneration of keratinocytes adjacent to Langerhans cells in pityriasis rosea (Gibert). Acta Derm Venerol 1976;56(2):99-103. Mysore V. Invisible dermatoses. Indian J Dermatology Venereol Leprol 2010;76(3):239-48.